It’s the post-holiday season and a new year. Many of us have overindulged during the past weeks, consuming more than usual quantities of rich and caloric foods. We might have gained a few pounds, or just feel a bit sluggish after too many delicious but not-too-nutritious treats. New year = new start. Protein and veggie or fruit-based smoothies make satisfying breakfasts, lunches, or snacks. They’re delicious and vitamin- and mineral-rich, yet don’t cost too many calories. My friend Laurie, an expert on liquid meals, shared her list of high-nutrition smoothie ingredients with me, and I came up with these basic go-to recipes. I invite you to add or substitute ingredients as you like. 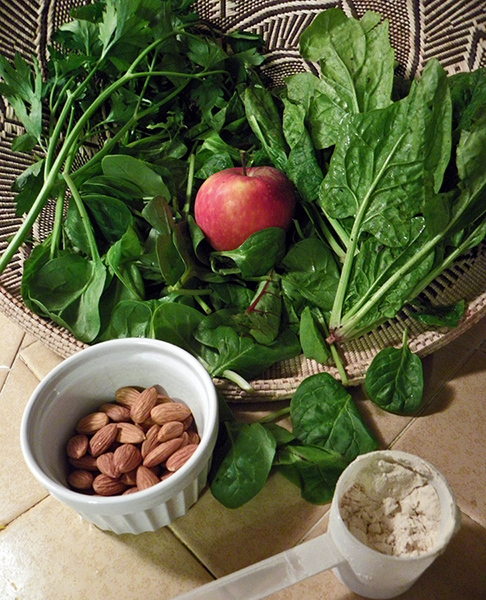 For example, though almonds are a nutritional powerhouse, you may want to use cashews, walnuts, Brazil nuts, etc. for variety. Cashew milk is an easy substitute for almond milk, or try light coconut milk. You can also add hemp seeds, sesame seeds, chia seeds, etc. Arugula, dino kale, sliced carrots, citrus fruits, and even broccoli or leftover fresh or steamed veggies can be added. Mint, cilantro, or a very small amount of thyme or rosemary can be used in place of basil, which is currently hard to find in Santa Cruz. 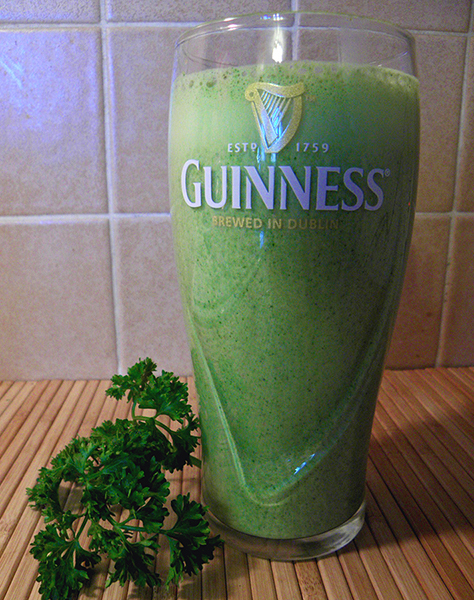 Parsley packs a nutritional punch, and increasing its quantity can flavor up the green drink. Experiment with different kinds of fruits and their proportions in the pink drink (which might become a purple drink). If you come up with a winning combo, please post it in a comment below! Wishing all of my readers all the best in 2017, and always. Here’s to a happy and healthy new year! 4 cups packed greens: mostly spinach, with young chard, kale, spring greens, etc. NOTE: Since ingredients in this smoothie are not frozen, it’s best served after chilling a few hours. I make it before work in the morning, then drink it on my break around 11. Grind almonds with almond milk in blender until liquefied. Toss in protein powder and blend again till smooth. Cut apple into pieces, remove core, and blend in. Then start adding greens, a handful or two at a time. Add soymilk as needed alternately with the greens to keep everything moving around in the blender. When smooth, add parsley and basil, and liquefy again. 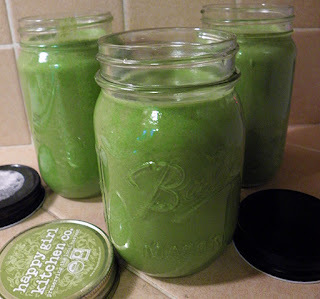 Pour into three 1-pint jars with lids (mason/canning jars work great). Refrigerate for 2 hours or more for best flavor (they still taste good if you drink them immediately). Drink within a day or so. NOTE: Since the berries are frozen, this smoothie can be served right away, or stored refrigerated for a day or so. Cut apple into pieces, remove core, and blend in. Then start adding berries a few at a time, unless your blender can handle more. Alternate with soymilk to keep it from getting too thick or cold (which can burn out certain blenders). When frozen fruit is liquefied, blend in banana and vanilla extract. Pour into three 1-pint jars with lids (mason/canning jars work great) or serve immediately, or a little of both! Drink within a day or so.